I am not allowed to post any more pickled deviled egg recipes here. I LOVE anything pickled and we all know that I love eggs, so it's just natural for me to want to post them every spring. They are just so pretty dressed in pink. Well, now my eggs are dressed in brown. How can something so simple have such depth and flavor? They have that "umami" thing going on here (3rd time I have said that word in a post, I'm starting to like it). This is a Japanese bento box snack, and it is now a Stacey snack. I loved these. A little sweet, rich and salty. Just a little bit of flavor that makes you want to take another bite. I see these sometimes topped on a beautiful bowl of ramen. I used tamari sauce, but a good quality soy sauce is fine too. Boil your eggs for 8-9 minutes. 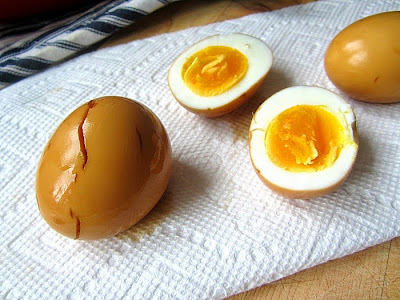 Run under warm water and peel immediately (you want the eggs to be warm). In a small saucepan, heat the tamari/soy sauce, sugar and vinegar. Simmer for a minute or two until sugar is dissolved. 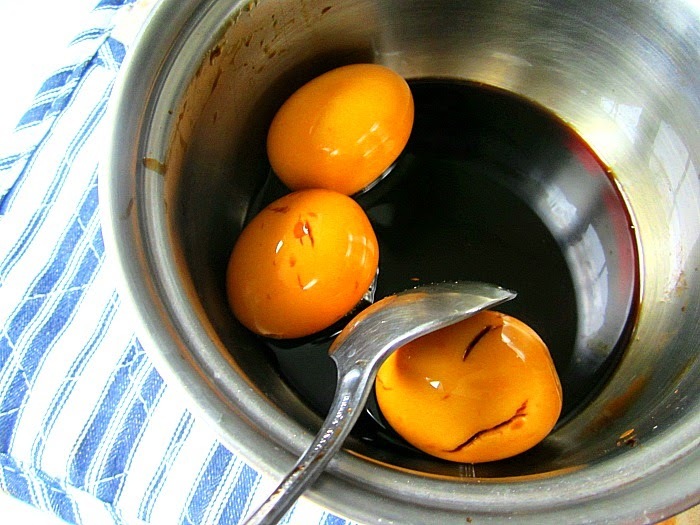 Turn off flame and roll the peeled eggs in this mixture for a few minutes, until chestnut brown. The longer you keep them in the sauce, the darker brown they will get. Best served warm, but still great the next day out of the fridge. Your 'little raspberry PISTACHIO cakes' are driving me NUTS because they have ALMONDS in them! Say what? Love the fancy brown parchment paper wrappings. Nigella Lawson used them for muffins - her description: "dark-brown, tulip-skirted party frocks". Sorry, still working on that Instagram account...I'm not as smart as you think, Ms. Snacks! This brought back a memory from 45 years ago (oh shoot I'm old!) when I first met my soon-to-be Chinese sister-in-law and my then 5 year-old niece. We went to Riverside Park where we had a picnic lunch and this little precocious 5-year old was devouring eggs just like these. While I, the young adult, had never even had soy sauce and had a lot to learn in the culinary world! I haven't seen them since then, and here they are on Ms. Stacey Snacks!